Readers sound off on pasture-raiased meat, veganism, and our cover art. Dear High Times Express: Saw your latest issue in the box — the one with the smiling Neanderthal holding the head of a murdered animal. Did not pick it up, as clearly it is not intended for me. Or for anyone else who cares about their fellow creatures on this planet. Too bad you keep shooting yourself in the foot with your frequently terrible cover art — your publication could be so much better if you did not think "edgy" means "interesting." 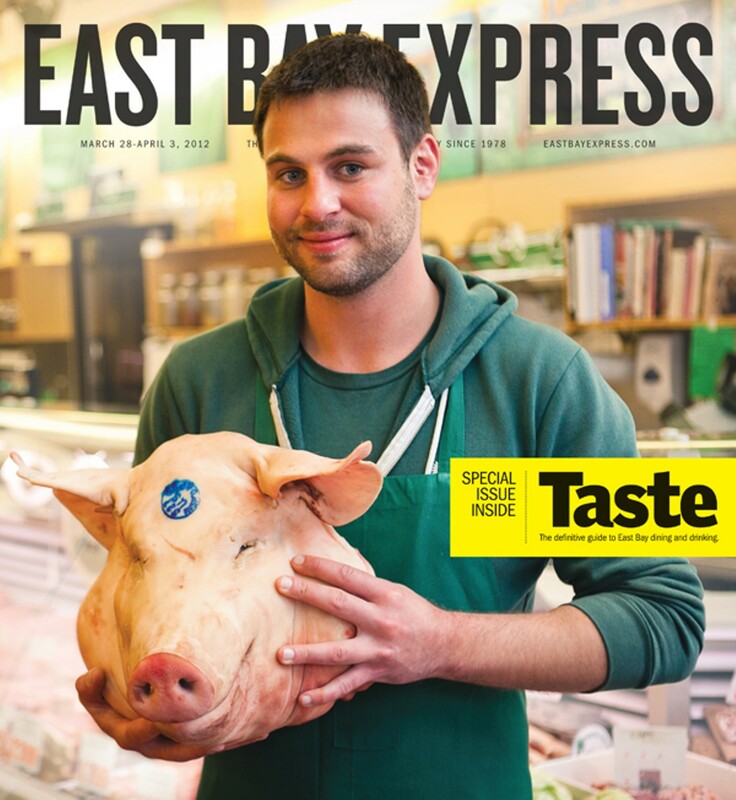 The cover photo of Aaron Lander holding a pig's head highlights the inescapable reality of eating even "humane" meat — you are still eating a dead animal that did not want to die. Farms such as Marin Sun Farms are definitely an improvement over factory farms, both in terms of the safety of the food source and animal welfare, but they do not solve the environmental or ethical problems that come with eating animals. First, at the rate Americans eat meat, there is simply not enough land to raise the nation's meat this way, even if factory farms went out of business. Second, raising cows and pigs for food still relies on large amounts of land and water for the feeding of the animals, the disposal of waste, and the packing process. Third, and most important to me, even pasture-raised animals endure the same slaughter practices as factory-farmed animals. They are sent to the same local USDA slaughterhouses as factory-farmed animals, where both workers and animals are exposed to horrors that have been amply documented, including animals being cut, skinned, or boiled while still conscious; being physically forced to the slaughter line; and being subject to outright sadistic abuse by workers overwhelmed and traumatized by the rate at which they must kill on a fast assembly line. (Although the USDA standards make attempts to lessen the frequency of these occurrences, undercover film footage as well as worker interviews suggest these atrocities are not isolated incidents). After I learned about the realities of factory farming, I was initially excited to learn about the "certified humane" label, which is meant is ensure that animals are treated decently during both life and the slaughter process. This is a noble goal that, like the efforts of Marin Sun Farms, gives animals a much better life than they would have in a factory farm. But when I read the actual details of what this means for slaughter — for instance, that in the more "humane" process, a cow is stunned a second or third time if and when it becomes conscious while having its artery cut or even being skinned — that was enough for me. I believe that people are drawn to pasture-raised sources of meat because they have a natural desire to not only protect their heath, but to not harm animals. But there is no way to eat animals without being part of a process that is inherently violent and sad. When you eat a plate of bacon (and I loved bacon as much as the next gal) ask yourself if you could do it with the pig's head Aaron is holding watching you, and if you really need it enough to demand that frightened animal's death. While it's certainly incumbent on those of us living with the moral ambiguity of eating meat to ensure that the meat in question comes from animals that at least had decent lives while they were alive, that is one pervy photo. Both the article and accompanying photo are indicative of extremely insensitive individuals who are trying to justify their need/lust/greed/attachment for having innocent animals killed so they can eat meat. The author and individuals quoted in this article are contributing to the control, abuse, violence, and premature death of social animals. These innocent animals have rights, feelings, and families and are not meant for human consumption. Humans do not need meat to meet our nutritional needs. If carnivores and omnivores are open-minded, knowledgeable, resourceful, and creative, they can easily enjoy nutritious and tasty vegan food and will not miss eating meat. Please contemplate what it would be like if another species killed and ate humans. Please do not allow your newspaper to perpetrate violence toward animals, and encourage everyone to treat animals with respect and kindness. It's very easy to write off any ethical side of supporting the meat business by throwing out "murder" as a reason not to. Why don't you actually learn about the sustainable farming and consumption of pasture-raised animals before you stand tall with your opinion? 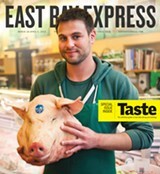 I was sickened to see a smiling young man holding a dead pig's head on this week's cover of the Express. The editors seem to have a strange idea of what is appealing to your readers. I certainly hope you will use more thought and sensitivity with future covers. This cover was in extremely poor taste (no pun intended). Granted, there are those who enjoy eating dead animals, but to show that kind of photo on the front page — or anywhere — does no justice for the animal who was slaughtered and butchered for meat-eaters' enjoyment. After having a fabulous vegan dinner at Souley Vegan, the up-and-coming vegan spot in Oakland, I grabbed a copy of the Express. As I walked out into the fresh air on a beautiful spring night, I was horrified to see a picture of a young man holding the head of a pig. I wasn't quite sure what the picture was trying to convey, but seeing the head of this most beautiful pig in the arms of the young man, I was devastated. How come it's so difficult for us to understand that these beings are no different from us, and certainly no different from the animals that we love and care for? I guess it just takes time for all of us to realize that we are totally connected to each other. Each of us is realizing this at different moments. Now that I realize how much the public values sustainability and humanity in their meat-eating choices, I have another solution to that of Marin Sun Farms. We could take all the unwanted dogs, cats, and horses at our local rescue organizations and eat them. They are just going to be euthanized anyway, right? We can load them onto a big truck, drive them to a local USDA-approved slaughterhouse, herd them into a line, and then restrain and stun them with a bolt to the head before they are hung upside down to have their artery cut and then be skinned. If all goes well, they won't feel a thing. If not, well, they'll eventually die in the process. And most of these animals got to live more than six months, so they probably had a good life with freedom to roam before we "harvested" them. Inhumane and horrific, you say? Cows and pigs are sentient beings, like dogs and cats. They feel affection, sadness — and terror at a violent death. Just because our culture endorses eating one animal while keeping another as a pet doesn't make it right. I live on plants and believe that there are also many vegetarians and vegans who are not "flocking" to pasture-raised animals. No matter how "nice" a life these beings had, most still meet their fate at an industrial slaughterhouse. And even if they are "farm-killed," they sure didn't want to die then, either. The act is still violent and unnecessary. Stop trying to pretty up the picture about killing innocent victims. There are plenty of better choices that don't demand we take anyone's life. I've been a big fan of Colleen Patrick-Goudreau since I discovered her podcast a few years ago. She has a unique way of presenting the compelling reasons for being vegan without being hostile or judgmental. I have learned so much from her about animals, food, and compassionate living that she has truly changed my life. I strongly encourage everyone — whether you are vegan, omnivore, or anywhere in between — to go see her presentation. One, thanks for spoiling one of the few plot points in the film. Two, I would say The Raid was the best action flick since Hard Boiled. This film makes you want to get a Kevlar neck protector. I think you all should get more knowledgeable music critics to review CDs in the Express! At the least, I would expect the writer to get the genre of music correct for the record that she is reviewing. Howell Devine is far from a "twangy country band." We are a blues band through and through. I think ten out of ten school kids would have known that after one listening of the CD. Rachel Swan can say anything she wants about the CDs she reviews, and that is fair enough, for music is very subjective to each individual listener — but girl, you gotta learn the basics of musicology, so you will know what kind of music you are listening to! In our April 4 cover story, "The Shrinking Stage," we misstated the number of Equity actors Shotgun Players is hiring this season; it's fifteen. In the same article, we incorrectly stated that Marin Theatre Company's Sasha Hnatkovitch is a woman.